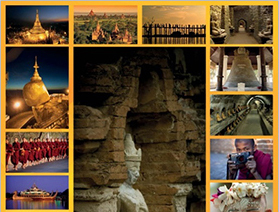 Our Classic Myanmar tour is a great way for you to discover the mystique and splendors of this marvelous country. We’ve combined the best sites, excursions and journeys into this 12 day Essential Myanmar tour, to offer an introduction to the country that is sure to leave a lasting memory and entice you to return. Then visit famous Chauk Htat Kyi, home to a 70-meter long reclining Buddha. The feet of the statue carved with traditional symbols and often many locals gathering to pay homage and pray. Photo stop at the Karaweik Hall royal floating barge. Nothing will prepare you for Shwedagon Pagoda, with its glittering gold stupa. At the pagoda observe local pilgrims and monks offering their devotions and enjoy the amazing sunset view at Shwedagon pagoda. You may continue sightseeing Temples & Pagodas and villages in the morning or take excursion trip to Mount Popa (45 km drive), an extinct volcano with spectacular views, 4981 feet above sea level. 777 steps lead up to the Buddhist shrine place on the top of the Popa peak. On the top of mountain there are monasteries, pagoda and shrines indifferent styles. In the mid afternoon back to Bagan and you will explore Bagan from a different perspective as you explore the area by Pony cart. The cart can explore areas that cars are unable to enter giving a different feel of Bagan. Breakfast at hotel. Pick up from hotel. Leave Bagan in the morning and take a private local boat across the Ayeyarwaddy River to Pakkoku (approx. 3 hrs by boat), an un-spoiled small town famous as a tobacco trading centre and for its weaving shops. This river journey is interesting because you see all types of local boats along the river as well as the local river life. Arrive Pakokku and visit the local market and see genuine indigenous regional open-air market. Then continue drive (approx. 4 hrs) to Monywa. Arrival Monywa and transfer to hotel. The rest of the day at leisure. Rise early to take the ferry to the other side of the Chindwin River where you board a pick-up to see the seldom visited 15th Pho Win Daung temple complex where more than 450,000 sandstone Buddha’s were carved in the hillsides in caves, alcoves, or tiny niches. The cave murals are still intact with indigo blues and soft pastels. Visit Shwe Ba Daung, which features unique pavilions cut from the surrounding sandstone and filled with Bubddha images. Drive back to Monywa. and visit Thanboddhay Pagoda. Inside you will see thousands of Buddha images (reportedly over 500,000) decorating every wall, archway and niche. The buildings in the compound have interesting jataka reliefs. Proceed to Mandalay (140 km – 4 hours). Arrival Mandalay and transfer to hotel. Full day sightseeing in Mandalay – visit the second most sacred image in Myanmar next to the Shwedagon Pagoda is the Mahamuni Pagoda. Next visit Golden palace Monastery famous for its intricate woodcarvings. Continue to the Kuthodaw Pagoda, which is known as the world largest book due to the Buddhist scripture carved on 729 marble slabs. Before sunset visit a 200-year-old teak bridge, the most photographic site in Myanmar. Morning- breakfast at the hotel. Following, you embark on a scenic boat cruise on the magical Irrawaddy River, watching river commerce and villages as they were centuries ago. Mingun is about 11 km (one hour each way) upriver from Mandalay and home to the impressive Mingun Bell, the world’s largest intact bronze bell, the unfinished Mingun Paya, and lanes filled with art galleries and bullock taxis. Visit Ava and then the cross the Ayeyawaddy River over Ava Bridge and visit the Sagging Hill where there are about six hundred Monasteries. Stop at Silverware cottage industry, clay pot making and Nunnery to learn the daily life of Buddhist nuns. Watch the sunset from the top of Sagaing Hill. Morning flight to Heho in the Shan state. Then drive an hour to visit famous Pindaya Cave and surroundings. Then drive to Kalaw (appr. 1 hour), a former British colonial town. Kalaw, another hill station as well as peaceful summer resort nestled in pine-clad mountains, is 1,400 meters above sea-level. In the neighborhood lie villages of Palaung and other hill tribes Overnight in Kalaw. After breakfast scenic drive across the Shan Plateau to NyaungShwe pick up boat & transfer to your hotel for check in. Enjoy the full day tour by private boat in Inle lake. Visit the Phaung Daw Oo Pagoda, the most holy religious site in southern Shan State. Be amazed by the local handicrafts, silk weaving, wooden handlooms and traditional blacksmith methods along the way. Continue our sightseeing in Inle Lake, maneuvering by boat though long, scenic channnels where you can watch the farmers cultivate their produce in “floating gardens”. You will visit the fascinating village of Indein, with it’s complex of ancient shrines and stupas and walk though exotic colonnades of stairways and shop stalls. You’ll visit the “long neck” tribal women, and weaving and craft villages perched on stilts. See the lake’s unique “leg rowers” – the Intha people row standing up with one leg wrapped around an oar. It is a feast for the senses and a photographer’s dream. Morning flight back to Yangon. Then enjoy a visit to Scott Market, the sprawling 75-year-old Market. At the market you will find a whole variety of interesting Burmese souvenirs, from lacquer ware to gems & jewelry – bargain at the stores to fully experience the Burmese market atmosphere ! Drive through the city and observe the influences of other cultures in the region.